As files get larger, so do the media storage devices that contain them. Nowadays, it’s not so out of the ordinary to hear of 500 GB or 1 TB external hard drives. But a 1 TB USB flash drive? That requires a double take. And that’s exactly what Kingston Technology wants. The renowned storage media company has recently announced that it will be releasing its 1 TB DataTraveler HyperX Predator early this year. The Kingston DataTraveler HyperX Predator USB 3.0 is, without a doubt, an ambitious undertaking. 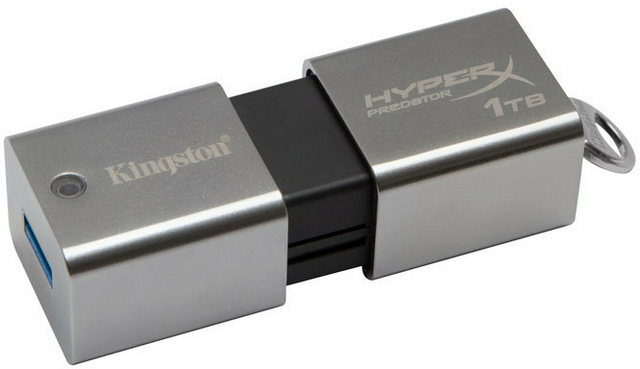 When Kingston Technology releases it, it will be the world’s first USB flash drive with storage as large as 1 TB. A flash drive of this size will most benefit users who often work with extremely large files, usually videographers and graphic artists. Another possible market group would be gamers who prefer to take their whole collection of games with them on-the-go. With target groups such as these, you can expect the DataTraveler HyperX Predator to deliver on performance. Transfer speeds are becoming extremely valuable for flash drives as files keep on getting larger and larger. To address this, the HyperX Predator will have reading speeds reaching up to 240 MB/s and writing speed of up to 160 MB/s, thanks to its USB 3.0 specifications. The impressive specs will be accompanied with equally impressive hardware. The USB flash drive will be housed in a metallic enclosure made of a zinc alloy that is about 3 inches long and 1.1 inches wide. According to projections, the 1 TB DataTraveler HyperX Predator will already be available to consumers within the first quarter of this year. Kingston has already released a 512 GB version of the drive in anticipation of the 1 TB incarnation. The 512 GB costs more than most computers at around $1,340, so it won’t be much of a stretch to assume that the 1 TB DataTraveler HyperX Predator will cost even more. With the expense, however, comes Kingston’s insurance of the flash drive’s performance in the form of a five-year warranty. Time will tell whether consumers will latch on to this new innovation from Kingston. This entry was posted in Kingston DataTraveler and tagged 1TB, DataTraveler, HyperX Predator, Kingston Technology, terabyte, USB Flash Drive. Bookmark the permalink.